Eve Goldberg, the 2018 Gil’s Hootenanny headliner, is a singer-songwriter who believes that she has a unique platform “to be a voice for social justice and the power of positive change”. For Eve, this commitment not only means writing issue-oriented songs, but also, and perhaps more importantly, creating space in her performances “to help create community by being inclusive and positive”. Growing up in a social justice-oriented family, Eve has vivid memories of her parents’ involvement with civil rights issues and the peace movement. Her mother’s family were union activists. Eve herself has worked with a number of peace and social justice groups, including the Toronto Disarmament Network and the Jesuit Centre for Social Faith and Justice. These days, Eve is actively involved with the musician’s union. 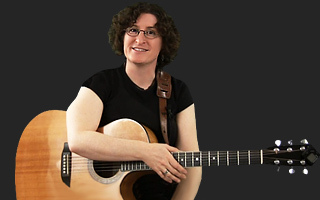 She is president of Local 1000 of the American Federation of Musicians of the US and Canada (AFM), which is the traveling musician’s local made up of touring folk and acoustic musicians all over North America. Gil’s Hootenanny will take place on Tuesday, May 1, 2018 at 7:30pm in the Clarke Room at the RA Centre, 2451 Riverside Drive. Staffed by UNIFOR members, the RA Centre is accessible, has loads of free parking and is well serviced by OC Transpo. Tickets are $10; kids are free. Tickets available online and can be purchased (cash only) at Metro Music, 695 Bank Street & Octopus Books, 16 Third Avenue. This entry was posted in 2018, Archived, Featured Artists on March 27, 2018 by Hollis Morgan.